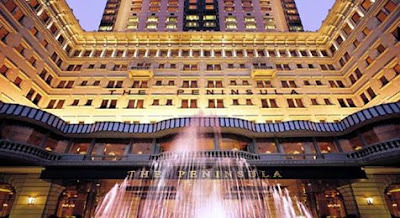 The Peninsula Hong Kong is one of the most historical luxury hotels here. Buildings in Tsimshatsui used to be limited to 18 storeys. Following the relocation of the airport, the height restriction was lifted and hence The Peninsula has a newer and taller building. Its modern appearance had a great contract with its traditional English look. Facing the harbour front at Tsimshatsui, The Peninsula has the best location to look at the Victoria Harbour and its world famous night view. Everyday towards evening, there are numerous photogenic fans with their tripods gathering outside the Hong Kong Cultural Centre (just opposite to The Peninsula) trying to capture the best of Hong Kong at night. Yes, to look at the beautiful Hong Kong night view, it is always the best to look from Kowloon side to Hong Kong side. You must be fully impressed by the breathtaking scene. Staying at The Peninsula, you don’t have to compete with the crowds. Just book a harbour view room, sit back and enjoy. Of course if you come around Chinese New Year, you would have an extra bonus of having one the best locations to view the fireworks. Apart from the harbour view rooms, The Peninsula has a fabulous rooftop restaurant with panoramic views and a sun terrace – both overlook the Victoria Harbour. I once had my company conference here and I really agree that it is a life time experience. Even I live in Hong Kong, I never had a chance to look at Hong Kong in such a fabulous breathtaking setting. If you are on luxury travel to Hong Kong, The Peninsula is one of the top choices. The Peninsula Hotel Hong Kong is famous for its fleet of Rolls-Royce limousines which are used to transport guests in style to various locations throughout the territory. In addition, twin helipads on the roof provide a convenient landing spot for guests who wish to arrive or depart by helicopter. What could be more luxurious! It was a beautiful hotel. It's the most wonderful hotel where I have been in Hong Kong. The Peninsula Hong Kong is superbly located looking.